William Gregory was also connected with ‘The Ilkeston Leader and Erewash Valley Advertiser’, a weekly newspaper which had a short life from 1861 to 1863, and of which he was joint editor with printer Stephen Bates. The latter was born in Ilkeston in 1840, the son of Market Place leather cutter John and Mary (Mellor). The first issue of the Leader appeared on May 2nd 1861, priced at one half-penny and a quick glance at its front page hinted clearly at its Non-conformist credentials. Following the fashion of the day the first page was taken largely by short ads, several by local tradesmen including the two printers of the new paper, three announcements by district Wesleyan Methodist Chapels and groups, and a trio of ‘Wanted’ ads. According to the editorial in the first issue of the Ilkeston Leader (page 2) the newspaper was being printed as an antidote to the Pioneer, ‘the organ of but one party, in the minority’ (Conservative), representing less than a third of the total populace of the town. The Leader would represent a wider range of opinion and a ‘freer public spirit’ — it would stand as ‘the champion of the rights and principles of Liberalism’ and ‘upon the broad basis of a resolute nonconformity’….. discussing issues of importance to working men like safety at work, hours worked and wage levels, the workers’ position relative to their employers, and improvements in their education and position. Page 2 also featured ‘Local News’ which, apart from one item about the anniversary at Cotmanhay’s Ebenezer Sunday School (see Samuel Chester) featured news from the outlying districts of West Hallam, Awsworth, Langley Mill, Sandiacre, Riddings, Selston, Ripley and … on to page 3 … Bagthorpe Common and Nottingham. Was the first issue furiously casting around for items of ‘local’ interest — or any item — to include?! 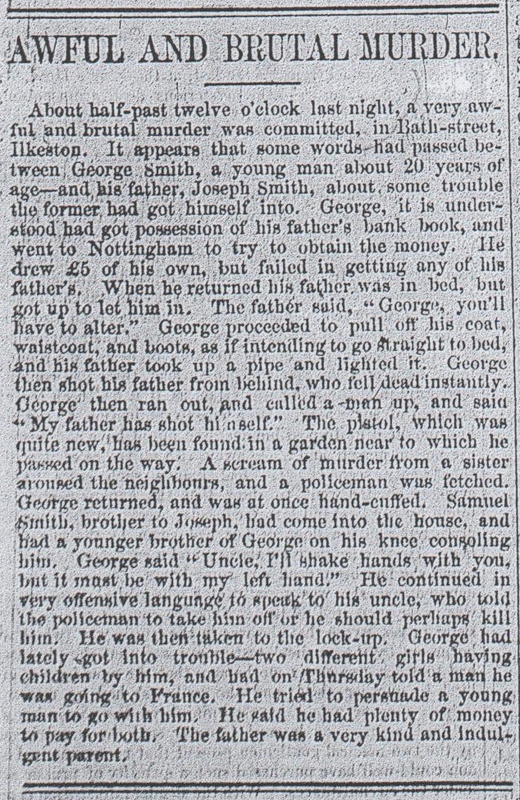 Page 3 continued with reports of a few cases at both Ilkeston and Smalley Petty Sessions — all run-of-the-mill misdemeanours of drunkenness, poaching and use of threatening language. After a brief section of ‘Parliamentary News’ the ‘Foreign News’ section centred upon a lengthy report of the opening salvoes in the American Civil War and particularly upon the surrender of Fort Sumter near Charleston, South Carolina, April 14th, taken from the New York Herald. This surrender encouraged the report to conclude that ‘it is of course impossible to foresee, at the present time, what shape the war will take…. If Virginia secedes (from the Union), and the other border states follow, the war will probably be long and disastrous’. A few days later Virginia voted to secede from the Union, followed by several ‘border states’, and the Civil War lasted almost exactly four years. The rest of this section took in visits to India, China, Russia, Austria, Italy and Poland. And tucked away in the first column of this page, this short article…. No need for a trial then?!? “Died at Ilkeston, on the 7th instant, in the second year of its existence, The Ilkeston Leader. From its birth it had been the subject of painful anxiety to its friends, who very considerately placed over its tomb the old distich…..
And now back into South Street.